In the global marketplace, people can work practically anywhere and anytime. Virtual teams cut across the boundaries of time, space, culture, and sometimes even organizations. Rising costs, global locations, and advances in technology are top reasons why virtual teams have increased by 800 percent over the past 5 years. 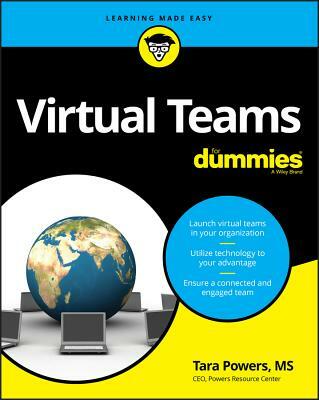 Packed with solid advice, interviews and case studies from well-known companies who are already using virtual teams in their business model and their lessons learned, Virtual Teams For Dummies provides rock-solid guidance on the essentials for building, leading, and sustaining a highly productive virtual workforce. It helps executives understand key support strategies that lead virtual teams to success and provides practical information and tools to help leaders and their teams bridge the communication gaps created by geographical separation--and achieve peak performance. Written by an award-winning leadership expert, this book is your one-stop resource on creating and sustaining a successful virtual team. A 20-year talent development professional, Tara Powers is an international best-selling author, award-winning leadership expert, and sought-after keynote speaker. She's worked with more than 200 companies and 15,000 leaders worldwide, building and launching talent initiatives that deliver high touch and high impact for her clients.